It is a truth universally acknowledged that I probably shouldn’t plagiarize opening lines from books I love but in this case I am borrowing: it is a truth universally acknowledged that a single person, in possession of an important story their heart needs to tell, must be in want of an Erin Klassen. I say ‘universally’ without exaggeration, or Jane’s original irony, as I’m sure Jane would too, if she met you: you being the kind of person who somehow manages to encourage; hold space for; discern; cajole; uncover; explore, champion and defend both what is real and what is transcendent. The kind of person who shares the fruits of that exploration with the world through beautiful publications and live events. You manage to do this by your fierce devotion to excellence coupled with the humility you have to acknowledge your own humanity, therefore making others comfortable to talk, write, read and share about their own. Some days, like all of us, like the real people you feature in your anthologies and on stage – you do not manage. That’s something that I think makes you beautiful. You’re a full-spectrum friend with room(s) in your heart for all the options. Speaking of options: like countless other singles, I find myself at the online version of the Netherfield Ball, that is: online dating apps. While I can blissfully skip the short corset in favour of zero bra and the kind of pants you’d only wear in year 5 of a relationship, and I don’t have Caroline Bingleys dripping death stares when I swipe right on men with just the right amount of sideburn, I DO have to negotiate the countless versions of Mr. Collins’ bearing armfuls of fish who inform me they “have singled me out as the companion of their future life.” Lucky me. I mention the apps, because some of them require you to answer questions and provide you with access to how your potential matches have answered them. Here are a few I check in with immediately once I have determined a solid absence of fish (and presence of shirts) in the pictures. Would you consider dating someone who has vocalized a strong negative bias toward a certain race of people? Ugh to the fact people answer yes to this. Do you believe one person has the ability to change the world? YES. You are one of them. With/out Pretend – its books and online publications; its team of incredibly talented creative minds; its storytelling events; its partnerships; its collaborations; its contributors; its artists and its audiences – all stem from the spark located in one warm, complex, inviting and creative space: the heart of its founder. YOU. 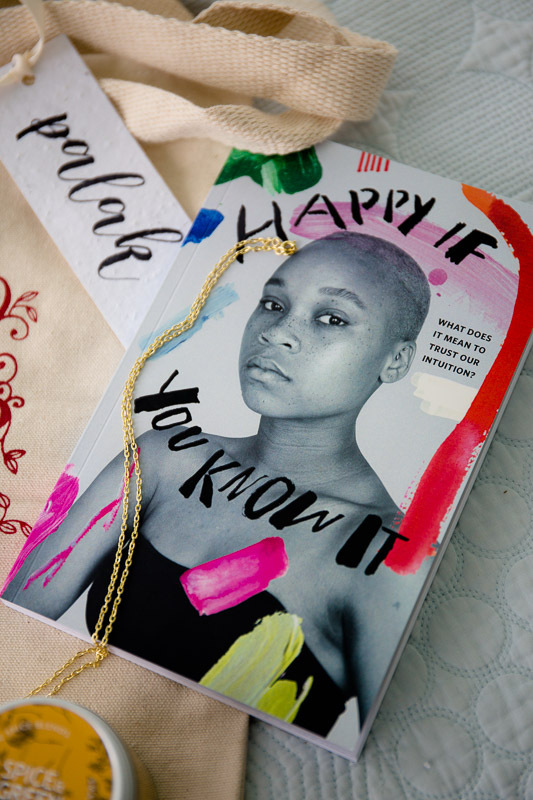 Your generosity in offering copies of “Happy if You Know It” to our retreat attendees is truly treasured: having been personally moved (to tears; to action; to deep and encouraging thought and feeling) by the stories you have curated, I can only imagine the ripple effect they will inspire in the women who attended reading them as well. To borrow once more from dear Jane: My feelings will not be repressed. You must allow me to tell you how ardently I admire and love you. There is nothing I enjoy so much as being witness to others following their calling and creating delicious spaces for you to connect and be inspired. You’ll find a series of love letters to creative kindreds I’ve discovered whose passion, talent and depth of spirit are palpable on the blog, and who generously donated their products to the women attending our retreat. Does this describe you or someone you know? Feel free to learn more about our partnership model here for our upcoming retreats. Want to attend a retreat in person? We have our Spring retreat coming up March 22-24th. Registration is now open. Learn more here!